In this project, use old sweatpants to make mittens for kids. This is a great way to recycle the fabric from all those holey, stained sweatpants (and sweatshirts) that no one can wear anymore. The project includes three sizes of patterns, each with two optional applique patterns. This is a good project for new sewers. Choose the size of mittens you want to make. The small size will fit most pre-schoolers, while the medium and large sizes work for older children. (The large size also fits small adult hands.) Download and print the pattern on computer paper. Tip: You can also make a pattern by tracing a child's hand on a sheet of paper. Be sure to allow for the ¼" (5 mm) seam and the ½" (13 mm) hem. Cut out the mitten and applique patterns on the black outlines, using paper scissors. Use the appliques on the mitten pattern or the separate appliques pattern. You can also make letter appliques using the alphabet patterns below in Step 3. Find some good areas on the sweatpants without any holes or stains. 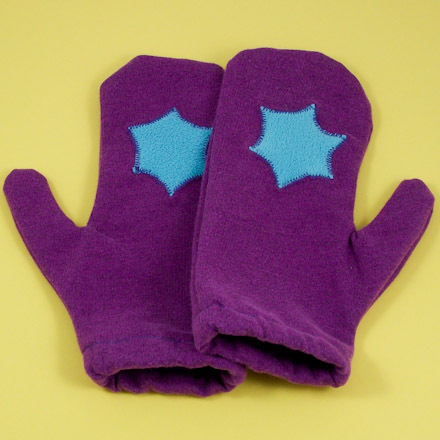 Pin the mitten pattern through two thicknesses of sweatpants. Cut closely around the mitten pattern. You will need four mitten pieces total, so after cutting the two pieces for one mitten, repin the pattern onto the sweatpants and cut again. Optional: You will need two applique pieces cut from a contrasting color of sweatpants. Pin the applique pattern to two thicknesses and cut. Project extra: To make appliques of your child's initial, download one of Aunt Annie's printable letter applique patterns—Letter Appliques A to M or Letter Appliques N to Z. Just cut out the letter needed, pin to two layers of material, and cut. 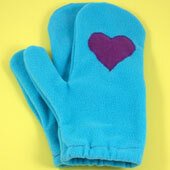 Tip: Instead of pinning, tack the applique pieces to the mitten back with a glue stick, then stitch. Pin each mitten's front and back together, right sides facing. Stitch around each mitten a scant ¼" (5 mm) from the edge, leaving the cuff open. Be careful to follow the curves at the top of the mitten and thumb. At the thumb joint, with the needle down, raise your sewing machine's presser foot and turn the fabric. Cut a piece of elastic that will fit around the child's wrist. Or use a 5½" (14 cm) piece for the small mitten, 6" (15 cm) for the medium mitten, or 7" (18 cm) for the large mitten. Fold a ½" (13 mm) hem over at the cuff. Stitch the hem down near the edge of the material, leaving a 1" opening in the back. Pin a safety pin to one end of the elastic. Thread this end of the elastic through the opening in the hem, and work it around until is comes out the other side. Be careful not to lose the other end of the elastic in the hem. Overlap the ends of the elastic about ¼" (5 mm) and sew through both layers several times with a needle and thread. Slip the joined ends into the hem and stitch the hem opening closed. Tip: See the sidebar for an alternative way to insert the elastic. Turn the mittens right side out. Use the eraser end of a pencil to help turn out the thumbs. Tip: The mittens can also be sewn by hand. Use a blanket stitch for the applique, and a back stitch for the seams. That's it! Your mittens are ready to wear! After making mittens from your old sweatpants, you should have enough fabric left over to make a matching scarf. For kids, a scarf doesn't have to be very long or wide—42" by 3½" (110 cm by 9 cm) should do. It may take some piecing together to find enough fabric, but this toasty double thickness scarf is worth it! Cut the legs of the sweatpants apart along the seams, discarding the seams. Cut the waist and the hems off and discard them, too. Lay the resulting fabric out flat and cut it into the largest rectangular pieces possible. With the goal of creating a long piece of fabric that's about 7½" to 9" wide by 43" or more long, cut all the rectangles down to the same 7½" to 9" width. Arrange the rectangles into one long stretch of fabric and stitch them together with ¼" (5 mm) seams. Trim the resulting fabric to the desired length. Create a double thickness by folding the fabric in half lengthwise, right sides facing each other. Stitch around the open sides about ¼" (5 mm) from the edge. Leave a 2" (5 cm) opening in the middle for turning the scarf. Turn the scarf right-side-out through the opening, using a chopstick or the eraser end of a pencil to push the corners out. 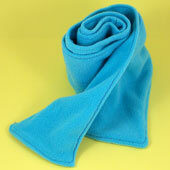 Topstitch ¼" (5 mm) from the edge all around the perimeter of the scarf, being sure to neatly close the opening. That's it, your scarf is done! Tip: Appliques can be sewn on the scarf before making the the double thickness (step #4). Wee Folk Art - Free Applique Patterns: Really cute ideas for adding whimsy to your mittens! Wise Bread - 20 New Things to Do with Old Jeans: Can't bear to part with that favorite pair of thread-bare jeans? Turn them into something cool! Many of these ideas can be used with sweatpants, too. 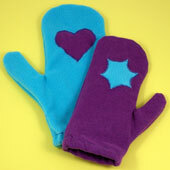 Tip: Make mitten sets with reverse colors. 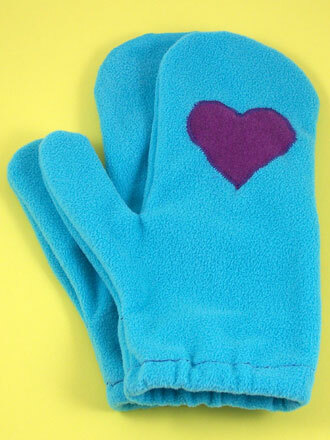 Cut mittens and appliques from two different colors of sweatpants and swap the appliques. Tip: Before stitching the appliques on, check that they are on the back of each mitten in the set. The thumbs should be on opposite sides. 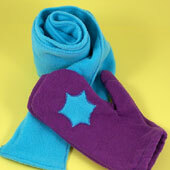 Tip: After making the mittens, there should be enough sweatpants' fabric left to make a matching or coordinating scarf. Instructions for making the scarf are included at the end of the project. Thanks to Janet LaFara for creating the original Mittens from Sweatpants project and patterns for Aunt Annie's Craft Page in 1997. Overlap the ends of the elastic about ¼" and sew through both layers several times with a zigzag stitch. Place elastic over cuff edge of inside-out mitten. Fold a ½" hem up over the elastic. Stitch the hem down near the edge of the material, enclosing the elastic.